This Friday, May 18 Music Network Presents Heidi Talbot, Breanndán Ó Beaglaoich, John McCusker and Paul Meehan in concert together for the very first time. To give you a taster of what is in store, below is a beautiful performance by the quartet performing on on their opening night of the tour on May 8th last week in Dublin’s Sugar Club. Rejoice in the energetic polkas and slides of West Kerry and waltzes, marches and reels from Scotland, as four folk musicians at the top of their game come together. The artists have joined forces for a series of eleven concerts across the country during the month of May. Well-known musician, singer and television presenter Breanndán Ó Beaglaoich is no stranger to collaborations, having worked with everyone from The Chieftains, Scottish fiddle player Aly Bain to Glen Hansard, and he been relishing this most recent project. The tour will bring the four musicians all over the country and West Kerry native Breanndán is very familiar with the north-west region and its music having worked with many well-known artists from Donegal, or inspired by its music such as Altan, The Campbells, Dermot McLaughlin and more. 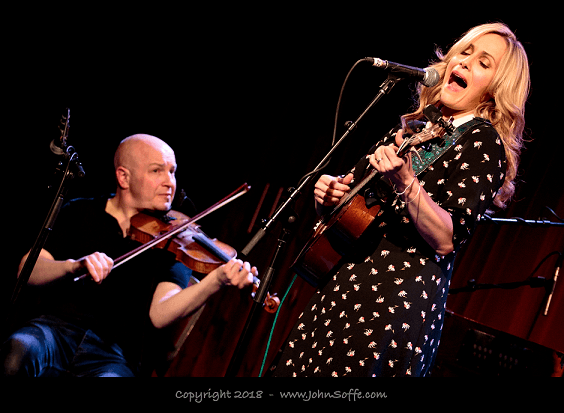 Chanteuse Heidi Talbot has garnered rave reviews for her live performances, both with Cherish the Ladies and as featured soloist with Idlewild, King Creosote and Eddi Reader among others, and the pairing of her expressive vocals with the extraordinary voice of trad maestro Breanndán Ó Beaglaoich is a match made in heaven. Winner of BBC Radio 2 Musician of the Year, John McCusker goes where other trad musicians fear to tread, sharing a stage with the likes of Paul Weller, Roseanne Cash, Paolo Nutini, Teenage Fanclub and Eddi Reader in addition to being a member of Mark Knopfler’s band since 2008. Completing this stellar line-up is Manchester-born guitarist Paul Meehan, who has toured with such high profile bands as Lúnasa, Na Dorsa, North Cregg and Buille. Unmissable! To book tickets for Music Network Presents: Heidi Talbot, Breanndán Ó Beaglaoich, John McCusker and Paul Meehan, click here.